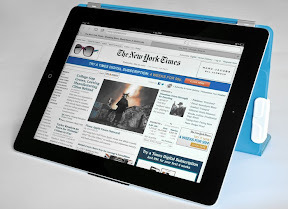 I am Therefore iPad: Smarter Stand turns your iPad Smart Cover or Smart Case into afull-featured iPad stand. Smarter Stand turns your iPad Smart Cover or Smart Case into afull-featured iPad stand. You all know that I love Kickstarter.com. I don't just back any project, I find items that work well with my iOS devices. I have backed yet another project. The project is called Smarter Stand. If you are an owner of Apple's Smart Cover or their new Smart Case, you not only will appreciate this but will want to back this project as well. This project is proof that it doesn't take a lot of money or brilliance to turn an existing great product into a better and smarter solution. Sometimes it just takes a simple need and applying some action towards a solution. The Smart Cover is one of the best accessories for iPad, but it's too limiting as an iPad stand: either its so reclined you can't see the screen or it's so upright that you have to back-up. What you really want is the iPad facing you directly, but the Smart Cover doesn't do that...until now! Smarter Stand is composed of 2 clips that attach to either side of the Apple's Smart Cover or Apple's new Smart Case. 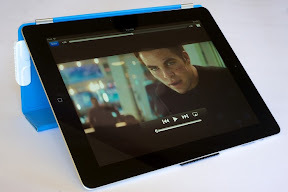 For the Smart Cover, a polyurethane pad that sticks to the back side of the iPad is also provided to prevent the iPad from slipping. For the Smart Case, no pad is needed since the neoprene of the back cover provides the grip necessary. You can achieve different stand positions by sliding the clips so they block the folds of the Smart Cover. Slide one clip over the first fold and you get a 33-degree stand position. The 33-degree stand position - great for watching movies. By moving the clips to different spots and combining them in different ways, you'll discover new stand positions including a private typing position that hides your screen from someone across from you (think job interviews, business meetings, ...). Slide the other clip over the second fold as well and you get 45-degree stand position. The clips are designed to slide perfectly on the Smart Cover (or Smart Case) yet they're tightly attached enough to stay on as you carry your iPad around. Just like the Smart Cover and Smart Case products, the Smarter Stand is sleek, minimalist and easy to use. It doesn't add any weight or bulk to the iPad. Wait... can't this be done with a couple of binder clips? Believe me I have already tried this after seeing this project. Yes, I was trying to save $11 (shipping included). It didn't work so well. Convenience: The beauty of the Smarter Stand is that it stays on your cover at all times so you always have it with you. It also provides the convenience of sliding the clips on the cover as opposed to having to detach and reattach them each time. Where would you carry the binder clips anyway? Plus your boss didn't authorize use of those clips for your cover, lol. Safety: Binder clips will damage your cover over time and will ultimately scratch your iPad screen too. Plus without the non-slip pad that comes with the Smarter Case, your cover will stand with the binder clip, but your iPad will slide around and fall. You don't want to take that risk. Elegance: Did I mention binder clips don't come in colors that match the Smart Cover and don't look nearly as sleek as the Smarter Stand? So If you've already spent $500+ on an iPad and a Smart Cover, another $11 to make them more convenient to use, keep them safe and make them look better is kind of a no-brainer! There's a zillion iPad stands out there. Why this one? True. There are a lot of iPad stands out there. I know because with my iPad 1 I bought quite a few. When I passed it on to my wife, she bought even more. With my new iPad, I own yet more cases; one of which is Apple's Smart Cover. Believe me... none of the cases I bought were as affordable as the Smarter Stand - even with the cost of the Smart Cover as well. I find that I use the Smart Cover more because it is light and thin. My other iPad stands are all too heavy and bulky to carry around; this defeats the core purpose of the iPad: being an ultra portable device. I am excited about the Smarter Stand because I will be able to have my iPad stand with me all the time without adding bulk or weight. And all that for $11. You can understand my excitement. 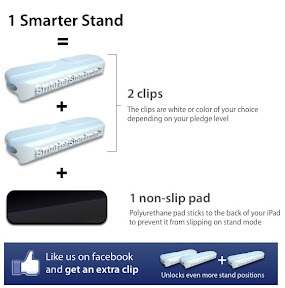 You can back this project for as little as $11 and you'll even get your own awesome Smarter Stand as a reward. So if this interests you, back this project now and spread the word!